GameFace is a training device specifically designed for various sports. With proper use the GameFace will proactively reduce chances of facial/dental injuries. The mask is made from polycarbonate (the same material bullet-proof glass is made of), which makes the mask ultra-lightweight but extremely strong. 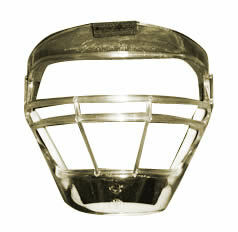 The masks unique honeycomb design gives the strikebar superior strength. The mask is ventilated for cooling and provides full visibility. The mask comes with high-impact, adjustable foam pads to provide maximum comfort and protection. ***MEDIUM SIZE*** Fits up to Hat size 7 or 21 7/8" head circumference.